"The FBI has informed families of the miners who died at Massey Energy's Upper Big Branch Mine that they may be the victims of a federal crime," Ken Ward Jr. reports for The Charleston Gazette. "The FBI letter was dated March 28, but was not received by some families until earlier this week. A copy was obtained by the Gazette." Ward posted his copy here. "Dickens grew up in dire poverty in West Virginia’s coal country and developed a raw, keening style of singing that was filled with the pain of her hardscrabble youth," writes Matt Schudel writes for The Washington Post. "She supported herself in day jobs for many years before she was heard on the soundtrack of the 1976 Oscar-winning documentary about coal mining, Harlan County, U.S.A. Her uncompromising songs about coal mining, such as 'Black Lung' and 'They Can’t Keep Us Down,' became anthems, and she was among the first to sing of the plight of women trying to get by in the working-class world." "It was my calling," Dickens says in a video profile of her by West Virginia Public Broadcasting, which is posted with Schudel's preliminary story. The full obituary is here. The Daily Yonder has an 8-minute clip from Mimi Pickering's documentary profile, Hazel Dickens: It's Hard to Tell the Singer from the Song, here. UPDATE, April 25: National Public Radio remembers Dickens as a folksinger and "a feminist bluegrass voice." For her interview with Terry Gross on "Fresh Air" from WHYY in Philadelphia, go here. 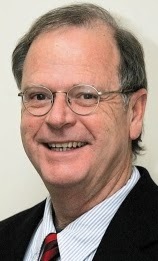 The original battle line of the Civil War is shaping up to be a key divider in the debate over the 2012 Farm Bill, the weekly Washington newsletter Agri-Pulse reports: "In what appears to be a strong difference of opinion between Northern and Southern growers over the continuation of direct payments, some are suggesting that growers should be able to choose" between such payments and a revised Average Crop Revenue Election program. "How such an 'opt-in' menu of programs would be structured remains to be seen," Agri-Pulse advises. Farm group leaders and lobbyists met last week to prepare 2012 Farm Bill negotiations, but no new program or consensus approach for the safety net emerged from the meeting. National Farmers Union President Roger Johnson said "everybody is beginning this discussion with the assumption that there will be substantially less money to write the next farm bill." He said farm programs also face a perception problem. "There is this presumption -- in the urban press in particular -- that if prices are good today, they're going to be good tomorrow, and next year and ever after, even though we all know that's not true," he told Agri-Pulse. Agri-Pulse is subscription-only, but offers a free, four-issue trial subscription. One year after Daniel Gilbert and the Bristol Herald Courier were honored with the Pulitzer Prize for Public Service, another rural journalist has been recognized by the Pulitzer board: Stanley Nelson, right, who has been working on an ongoing series about the murder of a black businessman during the civil rights era for the weekly Concordia Sentinel in Louisiana. He was announced as a finalist for the Pulitzer for local reporting when the award winners were announced this week. Nelson's reporting identified Arthur Leonard Spencer as the person who killed Frank Morris, a well-liked black businessman in Concordia County (wearing cap in photo). You can see an index of Nelson's work here and our previous item about the package here. For the Pulitzer release, go here. Representatives of the U.S. wind energy industry and the U.S. Fish and Wildlife Service announced this week they have signed a memorandum of understanding to work on developing a formal habitat conservation plan for Midwestern wind farms. The plan is aimed at "reducing the negative impacts of wind farms on migratory birds and bats while providing greater regulatory certainty to energy developers," and was signed by several wind energy companies and their trade group, the American Wind Energy Association, Scott Streater of Environment & Energy Daily reports. The conservation plan will cover Illinois, Indiana, Iowa, Michigan, Minnesota, Missouri, Ohio and Wisconsin. "The Midwest is among the fastest-growing wind power regions in the country, but it is also a critical flyway for millions of birds that migrate seasonally between Canada and the United States and Central and South America, as well as federally endangered Indiana bats," Streater writes. The participating states will spend $3.2 million in federal grant money on the project, and the industry has promised to match 10 percent of the grant money. One of Pennsylvania's largest shale-gas producers has suspended production on seven hydraulic fracturing operations after a well blowout spilled toxic chemicals into a local waterway this week. Chesapeake Energy, which will use a mix of plastic, ground-up tires and heavy mud to plug the well, said it was unsure of what caused the blowout a day and a half after it occurred, Edward McAllister of Reuters reports. Are dogs livestock? Yes, to rural people, but not to urbanites, writes Kansas City Star columnist Barbara Shelly, reflecting on last fall's referendum on what she calls the "puppy mill cruelty" initiative. Voters narrowly passed it, along a sharp urban-rural divide, and the state legislature recentlly voted to largely repeal it. Gov. Jay Nixon, who could veto the bill, has called for a compromise. Shelly writes, "City dwellers and suburbanites don’t think of dogs as livestock. But farm communities unabashedly do. And if animal rights groups can get voters to tell breeders how many dogs they can breed and how big their cages should be, what’s next? Telling farmers how many cows they can raise, maybe. Or forcing them to enlarge their barns." 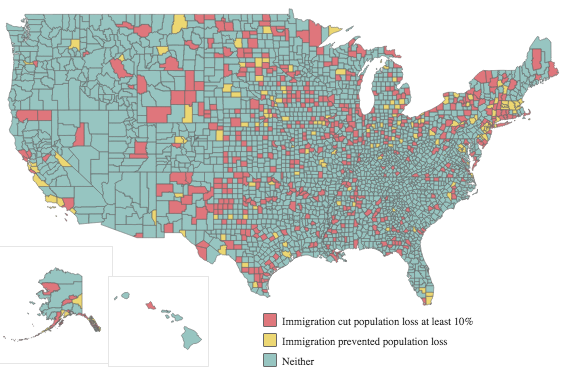 "Income inequality is increasing between counties in both rural and urban America. Income gains in richer counties are outpacing gains in poorer places. 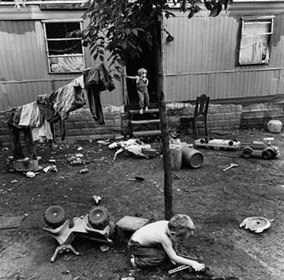 Meanwhile, there is growing evidence that inequality has a number of ill effects on society," reports the Daily Yonder, based on a study by Roberto Gallardo and Lionel "Bo" Bealieu of the Southern Rural Development Center at Mississippi State University. "An economic index based on a survey of rural Midwestern bankers this month reached its highest level in nearly four years and indicates optimism about the coming six months," Steve Jordon reports for the Omaha World-Herald. The Rural Mainstreet Index is based on responses from rural bankers in Colorado, Illinois, Iowa, Kansas, Minnesota, Missouri, Nebraska, North Dakota, South Dakota and Wyoming. 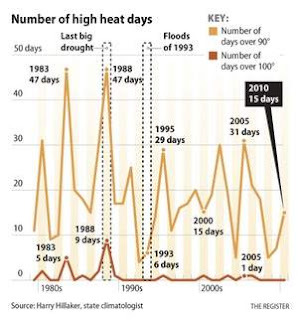 The latest index was was 59.4 on a 100-point scale, marking the sixth straight month above 50. A figure below 50 indicates a declining economy. “Higher oil prices have yet to derail or even slow the pace of growth for the Rural Mainstreet economy,” said Creighton University economist Ernie Goss, "who originated the index in 2005 with Greeley, Neb., banker Bill McQuillan. A year ago, the index was 44.2," Jordon writes. As part of a new education center being built at "The Wall" in Washington, the Vietnam Veterans Memorial Fund is seeking photographs of military members who made the ultimate sacrifice in Vietnam. Jan C. Scruggs, founder and president of VVMF, says in news releases designed for specific states, "We want to make sure that the 1,058 individuals from the state are honored and remembered in the Education Center." Four often-targeted federal programs with rural connections again survived the budget ax. "In recent years, leaders in both parties — including, in some cases, presidents from both parties — have singled out four programs, worth a total of about $337 million, to either be eliminated or lose millions in funding," David A. Fahrenthold of The Washington Post reports. "But they have survived, again and again, thanks to powerful lobbies or high-placed patrons in Congress." A program that sends millions to states that have already finished cleaning their abandoned mines escaped the federal spending debate unscathed, despite President Obama's attempt to cut it in 2009. And the program that pays cotton and peanut farmers to store their bales and bushels in warehouses was also unchanged by the compromise, regardless of issues raised by Obama and predecessor George W. Bush. The Agriculture Department's Market Access Program that costs about $200 million a year and pays to promote U.S. agricultural products in foreign markets was also spared from budget cuts. President Obama proposed cutting the Honolulu-based East-West Center's budget from $21 million to $12 million, but that went nowhere due to the project's strong support from Hawaii Democratic Sen. Daniel Inouye, chair of the Senate Appropriations Committee. 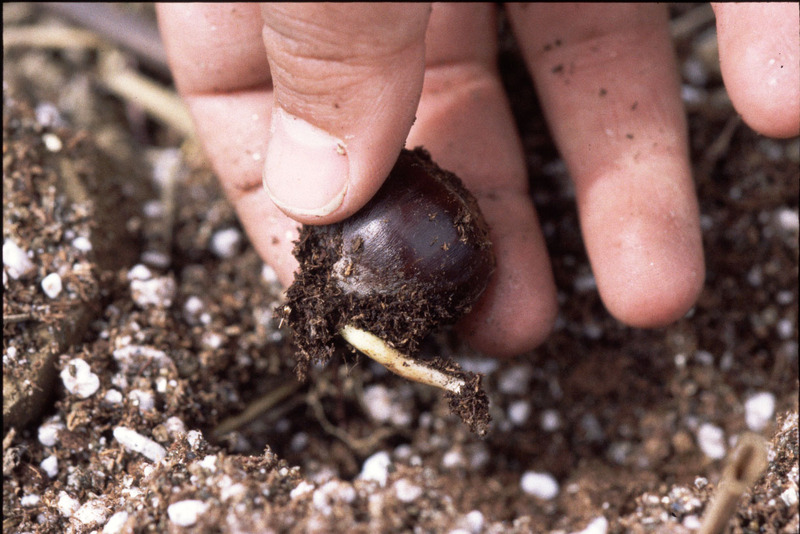 Hope for a revival of the American chestnut tree continues to grow, but it may be decades before its fate is known. Between 1904 and 1940, a blight imported from Asia attacked trees in New York and quickly spread, nearly wiping out an estimated four billion trees across the eastern U.S. Tina Susman of the Los Angeles Times reports that a new chestnut strain, created in a chestnut mating project and dubbed B3Fe, may produce a new generation of trees resistant to the blight. 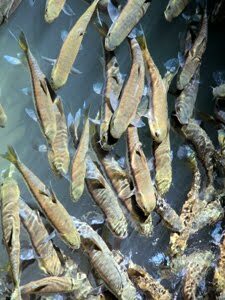 Fish habitats in streams and rivers across America are in danger, says a new report by the National Fish Habitat Board: "Almost 40 percent of the nation's freshwater fish species are considered at risk or vulnerable to extinction. Habitat loss is the most common cause for extinction of freshwater fish in the United States over the past century; many saltwater fish are also in decline due to habitat degradation." U.S. Environmental Protection Agency Administrator Lisa P. Jackson said Tuesday that the agency has no plans to regulate farm runoff into the Mississippi River. Jackson, "who visited two Iowa farms Tuesday with Agriculture Secretary Tom Vilsack, said she assured a gathering of agricultural leaders that the agency had no plans to impose pollution regulations like those being used to clean up Chesapeake Bay," Phillip Brasher of the Des Moines Register reports. She said voluntary measures should be given a chance to work. "I am ruling out the need for us to move directly to a regulatory mechanism when we have folks stepping up and are willing to do the conservation measures," she told reporters after the visits. Jackson has been under fire from Republicans and agribusiness groups amid rumors the agency was going to regulate dust, pesticides and water pollution, Brasher reports. Jackson says she realizes "there's been fear, real fear, that we would take what we're doing in the Chesapeake Bay and translate it here verbatim without regard to what is going on the ground." UPDATE, April 22: Jackson reiterated on her visit that EPA does not plan to regulate farm dust, reports Ken Anderson of Brownfield Network. 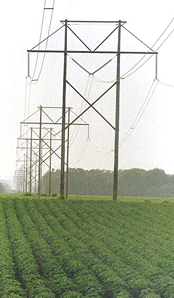 Jackson debunked other "myths" about the EPA and farmers, Ag Week reports. 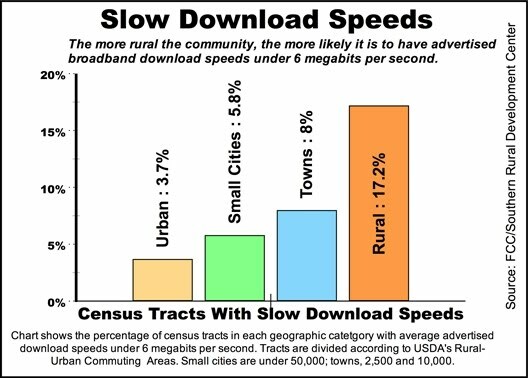 The more rural an area, the fewer broadband providers it is likely to have and the slower its download speeds are likely to be, says a study by the Southern Rural Development Center at Mississippi State University. 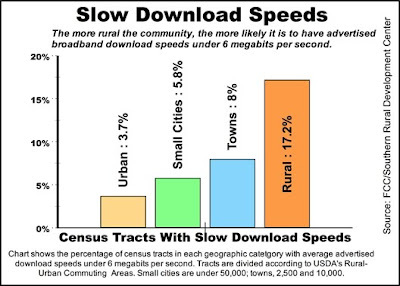 Using census tracts, small geographical blocks with an average of 4,000 people, "We were able to find consistent differences in data" from the National Telecommunications Information Administration, SRDC research associate Roberto Gallardo and Bill Bishop report for the Daily Yonder. 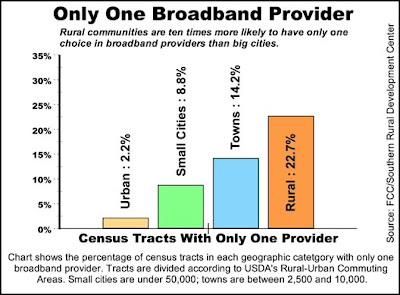 "That is, as census tracts go more rural, Internet service declined." Pennsylvania regulators are asking the natural-gas industry to voluntarily stop sending hydraulic fracturing wastewater to treatment plants that are not equipped to remove some contaminants. "Last year, the state adopted new regulations that require most plants that accept drilling waste to meet strict standards for removing pollutants, including barium and strontium," Robbie Brown of The New York Times reports. "But 15 treatment plants are exempt from those tough new rules. Tuesday’s announcement discourages companies from treating waste at those plants." "Since the early 1990s, the garlicky allium, with a slender white bulb, dark red stem and succulent green leaves, has gone from a Southern belle to a big-city starlet, with breathless articles in glossy magazines, top billing on restaurant menus and a paparazzi-like reception when the first crates arrive at farmers’ markets in April," Sen writes. The local food movement has pushed prices as high as $12 a pound. "We’re so over winter, and we’re so ecstatic about ramps," New York City chef Marco Canora told Sen. "There’s nothing local right now. 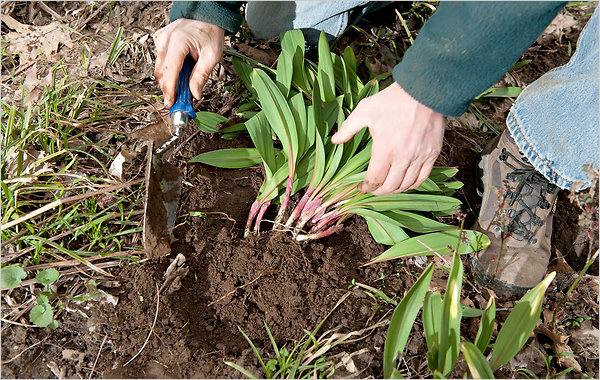 These ramps are the first local spring thing." Pressure on U.S. corn farmers may be at an all-time high as they prepare to plant this summer's crop. "Those huge surpluses of corn that Americans have taken for granted for generations are gone," Dan Piller of the Des Moines Register reports. "The amount of U.S. corn is expected to shrink to scarcely more than a week's supply by late summer, reduced by a smaller crop last year and record demand from ethanol plants and other countries." Any problem with this year's crop could send prices to unprecedented double-digit levels. The Appalachian Center at the University of Kentucky recently announced its "Re-Imaging Appalachia" photography contest. The competition, open to all U.S. residents 18 and up except UK faculty and staff, aims to recast the region's image. Zak Pence of the center writes, "Barefoot children. Outhouses. Shacks with no running water. ... These are some of the first images you'll find if you Google 'Appalachia'," and here is one, from Bizarre Foods. The center will give prizes for the top three photographs. Those pictures and 30 others will be displayed at the university and featured in a calendar. All entries must have been taken after May 1, 2008 and within the region served by the Appalachian Regional Commission. Entries are due by May 2. To enter or see the official rules, click here. 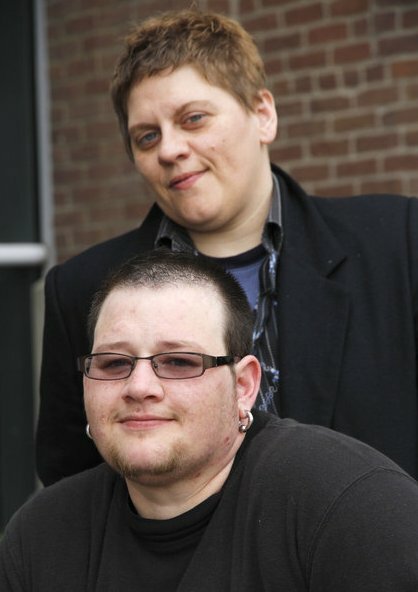 Ratliff, a Hindman native, told Hjalmarson she did not know she was a lesbian while growing up in Knott County, but her close group of friends from high school have almost all come out as gay or lesbian since. "It was very tight-lipped," she said. "They all came out one at a time. We never discussed being gay. We never talked about anything queer at all. We met as straight people." Ratliff said she began to understand her identity after attending Eastern Kentucky University, which she calls a haven of opportunity for people from the mountains who are at all "different." She added, "The mountains are ... beautiful, and there's still just so much culture; they're comforting, protective. And they're also very isolating." StoryCorps will hold interviews at Veterans Memorial Park in Whitesburg from April 21 through May 14 and at the Farmers Market Pavilion in Lexington from May 19 through June 25. Internal documents released by the Mine Safety and Health Administration provide examples of lax enforcement dating back to 2008. 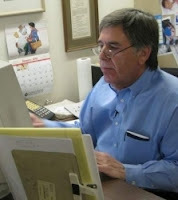 Documents from the agency's Office of Accountability show "MSHA supervisors often failed to properly review inspection documents, mine inspectors were sometimes lax and inconsistent in their reviews, and some mine inspections weren't conducted according to agency standards and legal requirements," Manuel Quinones of Environment & Energy Daily reports. 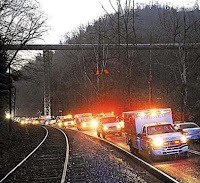 The documents were released Friday "in response to pressure from House Republicans skeptical of a push to expand MSHA's regulatory power after the Upper Big Branch explosion that killed 29 miners last year in West Virginia," Quinones writes. Field offices in Vansant, Va.; Summerville, W.Va.; Hindman, Ky.; Morgantown, W.Va.; and Harlan, Ky., were among those documented as having enforcement lapses. Specific dates, auditor names and information about specific mines were redacted. 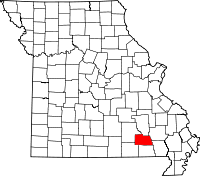 Carter County, Missouri (Wikipedia map) appeared to be resisting the state trend in increasing methamphetamine raids and arrests, but that may have been a result of corrupt law enforcement. "Tommy Adams, county sheriff for a little more than two years, was arrested earlier this month after giving meth to an informant at his cabin on a remote and hilly gravel road, according to a court document," Jim Salter of The Associated Press reports. "Authorities would not detail the extent of Adams' alleged meth involvement, but charged him with meth distribution." Missouri led the country in meth lab busts every year for a decade, reporting over 13,000 in the last seven years, before Tennessee took the top spot in 2010. Other rural Missouri law enforcement officials have been linked to drugs, but Adams is the first to be arrested for meth. Just days after Adams' arrest, his chief deputy was charged with burglary and receiving stolen property, a gun taken from the department's evidence room, Salter writes. The Virginia attorney general's advisory opinion released last week on carrying weapons in houses of worship has sparked strong reactions, but guns in churches are not uncommon in some parts of the state. Attorney General Ken Cuccinelli's opinion, which said people with "good and sufficient reason” to carry a weapon can do so in a house of worship, has led some to call "it an affront to the tradition of the church as a sanctuary from violence," Susan Kinzie of The Washington Post reports. "Others said: 'Praise the Lord, and pass the ammunition!'" A 1632 Virginia law required men to bring their guns to church, Kinzie writes. "In case of an attack on Sunday, when everyone is assembled at church, they don’t have to disperse to get their arms," S. Max Edelson, an associate professor of history at the University of Virginia, told Kinzie. Today many Virginians "carry guns openly at places such as grocery stores, parks and some polling places. Some conceal the weapons if they have a permit to do so," Kinzie writes. Duke Energy announced last week it will purchase non-mountaintop-removal coal when it costs no more than mountaintop-removal coal. Last year Duke asked its suppliers to quote the price and availability of non-mountaintop coal after recognizing growing public criticism of the mining practice, Bruce Henderson of the Charlotte Observer reports. Suppliers informed Duke "about 10 percent could be guaranteed as non-mountaintop without costing a premium," Henderson writes. "Duke says it has signed contracts, mostly for one or two years, for that amount." "I won't say it's a surprise, but the question had never been asked before," said Duke's senior vice president Paul Newton, who oversees fuel purchases. "It could be more or less in the future. What we do intend to do is continue to ask the question in the future." Duke says suppliers could not guarantee more than 10 percent because coal mined underground and from mountaintop mines is usually blended together. "Duke estimates that about 25 percent of the coal it burns in the Carolinas comes from mountaintop mines in Virginia, West Virginia and Kentucky," Henderson writes. Alpha Natural Resources announced Friday that several Massey Energy executives will keep key roles in the combined company after Alpha acquires Massey. Federal documents and interviews with mine-safety advocates show that "Alpha has a safety record and reputation that is better than the record and reputation of Massey Energy," Howard Berkes of National Public Radio reports." Despite that record, "Massey Chief Operating Officer Chris Adkins will 'spearhead the implementation' of Alpha's main safety program." In the latest example of bipartisan cooperation on corrections issues at the state level, fostered by the Pew Center on the States, Kentucky lawmakers agreed last month to overhaul the state's sentencing system and save an estimated $420 million over the next decade. Ronnie Ellis, right, statehouse reporter for Community Newspaper Holdings Inc., detailed the process for readers of The Crime Report in a story published today. The state's prison population grew 80 percent from 1997 to 2009 and the corrections budget grew from $30 million in 1980 to $470 million in 2010 even as lawmakers cut $1.8 billion from the overall budget. "At every opportunity, they stiffened sentences and added offenses to the state’s penal code," Ellis writes. They nearly bankrupted the state." As part of the reform, lawmakers "overhauled the state’s drug laws, as well as its sentencing, probation and parole system" which is expected to lower prison populations and expand drug treatment. Rural counties had skin in the game. "Jails were bleeding county budgets dry, but counties feared the task force would recommend changing low-level felonies to misdemeanors, thus shifting inmates and additional costs to them," Ellis writes. A bipartisan task force representing all three branches of government held public meetings and conducted research about prison reforms that had worked in other states. "It was abundantly clear that they were going to do something," Chris Cohron, a prosecutor and past president of the Commonwealth Attorneys Association, said. "If we didn’t participate in the process we’d be stuck with whatever they came up with." Democrats in the U.S. House released a study yesterday detailing how "Oil and gas companies injected hundreds of millions of gallons of hazardous or carcinogenic chemicals into wells in more than 13 states from 2005 to 2009," Ian Urbina writes for The New York Times. The report notes that some chemicals used in fracking, including salt and citric acid, were harmless, others, including benzene and lead, were "extremely toxic." "Democrats on the House Energy and Commerce Committee described their report as the first comprehensive national inventory of chemicals used by companies that engage in a process known as hydraulic fracturing," generally called fracking, Stephen Power writes in The Wall Street Journal. "It is deeply disturbing to discover the content and quantity of toxic chemicals, like benzene and lead, being injected into the ground without the knowledge of the communities whose health could be affected," said Colorado Democratic Rep. Diana DeGette who released the report along with California Democratic Rep. Henry Waxman and Massachusetts Democratic Rep. Edward Markey.